Not too long ago, I recently watched a video on YouTube from movie critic Chris Stuckmann on the problem with horror movies today. Not only did I agree with his points, like how audiences are accustomed to jump scares, but that video is where I first heard of the subject of this review, The Babadook. 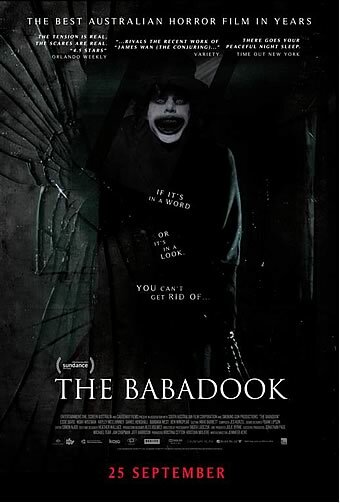 Thankfully, he discovered this film, and I stumbled across his "Problem With Horror Movies" vid, because The Babadook is a true gem. One thing that I really liked, which really surprised me, was how even though it is about a monster, it isn't technically a monster movie. I'm going to do my best not to give it away, but I'll say that the Babadook is somehow weaved into the film's deep themes of grief and depression. Very rarely do we see horror films have some kind of meaning behind them or thematic material, but this was a very nice change of pace. Next, I'll get into the lead performance by Essie Davis. Essie Davis was absolutely incredible as Amelia and gives very double-sided performance as at first, I found myself carrying for her, then as the film progresses, wondering whether I should fear her. It is not a typical female lead performance from a horror film, but a very rich and complex character. At first, and I hope I don't come off as mean since he is a young child actor, but I honestly thought Noah Wiseman was a bit annoying but that is only because of his character's constant hysterical fits. Plus, I eventually got to care for his character once the 'coins have been flipped' so to speak. I'll just leave it at that so I don't give anything away because I think you guys should really see this. I'll only say that you hardly see the Babadook's face. Once you watch the film, you'll probably find out why. I also thought the way the film was shot, by director Jennifer Kent and cinematographer Radek Ladczuk, was nice and helped aid the film's rather unsettling atmosphere. This is Kent's first feature film and I could already see her being one of the horror greats. The genre could certainly use one of those. Overall, The Babadook is a highly creative monster movie that is interestingly hardly about the titular monster at all. It is beautifully directed by Jennifer Kent, has a knockout lead performance by Essie Davis, and features a dreadful yet chilling atmosphere. If you like horror movies, yes. But this isn't really for every horror fan since it requires a good amount of thinking and there aren't many audiences that gravitate towards those types these days. Although, if you are a fan of much older horror films, from the 70's and even the 80's, you will probably enjoy this.